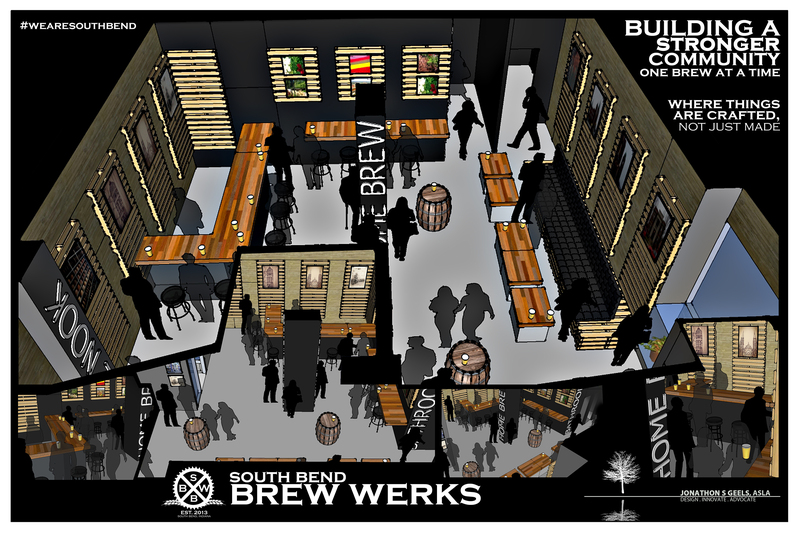 A digital rendering of the South Bend Brew Werks floor plan design of the new brew pub. South Bend Brew Werks served samples of their locally crafted beer at The State Theater Sunday, Feb. 9, to promote the new brew pub they’re opening up in what is currently their home brew supply store. The soon-to-be brew pub sits next to The State Theater off of Michigan Ave. and is currently going through renovations to accommodate both a brewery in the basement and a pub serving local food and beer on the main level. “Building a stronger community, one brew at a time” is the mission behind South Bend Brew Werks, according to their official website. “Master of the Brew” at Brew Werks, Joel Miller, was serving samples of their 9 Aye Black IPA beer and talking to people about beers that will be featured at the brew pub. As his title indicates, he is the man behind the beer-making. “It’s 9 Aye because when Brew Werks went to the city council to get approval to brew, the vote was a vote of nine aye,” Miller said while pouring out a sample. He said they thought the name would be a good way to capture the moment and have the name tell a story. Elegante said they are going to open with five beers. One of them is an oatmeal stout named Colonel Eddy, named after a local man who was prominent in the area in the mid-1800s. “All the beers will have some sort of South Bend or Michiana flavor to it. We really want to represent South Bend well,” Elegante said. He hopes to open the brew pub at the end of March. Elegante has been running a crowdfunding campaign to help with the set up of the pub. He said the community can get involved and be a part of the story. Contributors may have a chance to be listed on the “founding supporter” wall, name their own menu items or help craft a limited edition beer, depending on the contribution made. Elegante said the menu has a “farm-to-fork” concept that will be crafted by Greg Wisniki, their “culinary ninja.” The menu will start off by offering items like gourmet mac & cheese and flatbread pizzas, developing more options as they grow. Elegante said as the business progresses, they hope to expand both their food and drink selection. “We’ll start with five beers on tap when we open and then eventually expand to ten. We’re going to focus on American ales, English ales and Belgian farmhouse style,” Miller said. Matthew Heckaman, South Bend resident and beer enthusiast, said he is a big fan of microbrews as he sipped on his sample of 9 Aye. “I was born and raised here. I used to work at the Mishawaka Brew Co. so to have something that is locally made and made well is going to be an asset to this area. I feel like brew pubs tend to be just a great community-building spot,” Heckaman said. He said he’s looking forward to the opening of the brew pub and trying the other beers they’ve crafted. “I think the most exciting part is having people coming in to try our South Bend made beers and offering distinct local flavor,” Miller said. To learn more about South Bend Brew Werks visit their website at www.southbendbrewwerks.com. To learn more about the crowdfunding campaign visit www.fund.sbbrewwerks.com.